A link to source: transmediale 2018 exhibition “Territories of Complicity” documentation website (Sprawling Swamps); via a still image of Sprawling Swamps (2016-ongoing) by Femke Herregraven – installation, interactive 3d environment, video, audio. Let’s continue the discussion from the previous post, where I observed recent transmediale, in particular, its last panel ‘Confronting Social Cybernetics’ that revisited Marshall McLuhan’s legacy and catalysed transmediale’s self-criticality. As mentioned in the post, one participant from the audience suggested to look for alternatives for the discussion, and drew attention to the activity of ‘doing.’ In this respect, there are two truths. As moderator Baruch Gottlieb noted – the festival is a ‘structure’ and a ‘product’ as such, and at the same time, if we look at the website information, it is clear that the work of the whole transmediale collective is enormous research and through that – translation. So, if ‘doing’ is interpreted as aesthetics, discussion – as translation, how to compare aesthetics and translation? The meaning of aesthetics is diverse. Aesthetics can characterise any thing, it can be immediately related to art, but let’s ignore this and apply a more theoretical parameter for a start – aesthetics as opposite in nature to activity of translation. The difference is that ‘translation’ is considered transparent – it draws attention to something else such as knowledge; but we call something ‘aesthetics’ when it has intrinsic value of reality within itself. Even though translation can be thought to be minor, it is obviously very demanded. Often it is important that aesthetics is translated or discussed. But if something that is expected to be ‘translation’ and subject matter is aestheticized then its reception can be mixed. For example, professor Dave Harris has devised youtube series – Deleuze for the Desperate to give resources and tips to those students who need to come to grips with the popular Thousand Plateaus by Deleuze and Guattari which is considered difficult by any standard. But the language of Thousand Plateaus, as Harris confirms, is ‘deliberately rambling.’  So on the one hand, aesthetics presents challenge, on the other hand, Deleuze & Guattari insist on experiencing aesthetics rather than clarity/translation. Where is the balance? tansmediale is translation only to an extent; its quality as translation is absorbed within aesthetics of the whole event, and particular artworks. Art that occupies itself with research and translation prioritise aesthetic rights. During the panel ‘Extracting Hi(stories) of Complicity’ at transmediale 2018, Femke Herregraven was questioned in relation to her work of visual mapping and imagery that pointed to exploitation of natural resources through infrastructures of capital. The question was about where she situated herself between aesthetics and activism, and I think ‘aesthetics’ was used in the sense of beautification. The artist noted that one way of communication is through an article, but artist operates differently, and if images can attract attention then it is considered effective. The audience comment above also evokes that activism is more closely related to what is considered translation, not aesthetics. If I remember correctly from transmediale 2018 discussions, a comment was made at some stage that aesthetics was not necessarily good, meaning that perhaps it was not necessarily effective. Even though the spirt of transmediale is that of activism I think it is wrong to disconnect aesthetics from activism. A discussion is activism, not because it is a discussion but because it presents itself as an aesthetic form of resistance. It is already the activity of ‘doing.’ In fact, translation and aesthetics are entangled. Perhaps the distinction between what is considered activism and aesthetics is so strict because the current tendency of activism is focused on the strategies of subversion, confronting and negation as demonstrated by transmediale. The radical spirit for social change needs to be negating (violent, as McLuhan would say) but the classic avant-garde had the capacity to be affirmative in its nature. It has been interesting to follow e-flux collaboration with Boris Groys as they recover materials and previously overlooked histories of avant-garde – just this month e-flux journal (#88) ‘Russian Cosmism’ has been published. The world-building idea of this classic avant-garde seems to be different from, for example, transmediale. I think excavation of avant-garde is very timely to glean from, and I am convinced that it is effective to apply active aesthetics as world-building. But it can be also sensed, that there is a need for ‘building.’ As I mentioned in the previous post, during the Confronting Social Cybernetics panel Jonathan Beller deliberately appropriated the ‘negative’ voice which could be seen very much in consistency with transmediales overall tone. But he weakened negativism and perhaps in a much more McLuhanist way highlighted the idea of ‘re-organizing imaginaries’ with the awareness our distributed personhood. And it feels that re-organizing imaginaries is reliant on concept of building (innovating?) rather than destruction. A form of violence as world-building is possibly the only real form of violence. Dave Harris, Deleuze for the Desperate #1 Introduction, published January 31, 2016, YouTube. Marshall McLuhan Speaks, image by cea+. Sourced from Flickr, Creative Commons licensed. Sunday night, on the 4th of February 2018, I could stay awake: at 5am in the morning (Melbourne time) I was still happily watching the streaming transmediale in Berlin. I was drawn to the last panel ‘Confronting Social Cybernetics’ due to its cultural angle and determination to revisit Marshall McLuhan. After a video fragment from McLuhan’s famous debate with public in the 70s Katerina Krtilova in the panel suggested: the same Luhan’s statement ‘the medium is the message’ is to be reformulated for today with the focus on ‘message’ rather than the medium. The shift is clearly expressed by words in the title of the panel (Confronting Social Cybernetics). But armed with this very claim for confrontation under the overarching trope/ McLuhan’s legacy – ‘technology is not neutral,’ the session turned into a self-critical transmediale. Soon a voice from transmediale’s audience reflected upon alienation by the language and gathering of the agents of language who seemed to congratulate each other. One participant wanted to do ‘stuff’ with people in the room and proposed to look for alternatives to the ‘aboutness’ of the discussion format. Another suggested being ‘present’ because the criticisms at transmediale, such as ‘one cannot see art’ stressed that we were too hung up on the form of something. Yet another participant insisted to forget about McLuhan and cited a couple of German news reports about transmediale that were predominantly interested in form: not about medium-as-message, but the form in the festival – good-looking audience and hipsters. Then, another member of the audience appreciated that transmediale had put the chilling issues like current rise of fascism on the table so they can be addressed. The commentary resembled the genius question to McLuhan included in the historic video that was played at the start of the session. 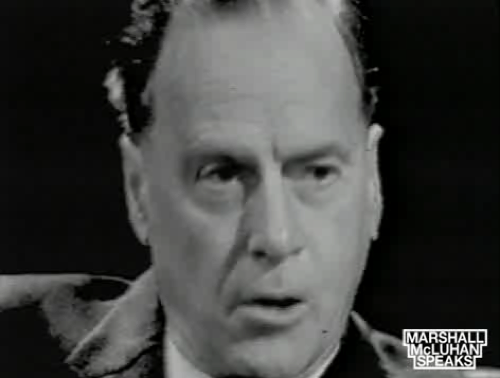 In 1977, McLuhan debated live on Australian TV before a large audience; the lady featured in the video phrased her question this way: ‘If the medium is the message and it doesn’t matter what we say on TV, why are we all here tonight and why am I asking this question?’ (see Marshal McLuhan ‘The Medium is the Message’ Part I, Monday Conference on ABC TV, 27 June 1977 07:06). This self-reflective point from public enquires into the value and meaning of social activity and agency when the social environment is shaped by media complexes. Even more so, the question started echoing the very theme of transmediale 2018 ‘face value.’ The notion ‘face value’ indicates the problem of misleading value perceptions, according to what is printed or what appears to be, and points to the invisible side of media systems from Wall street finance to extreme right-wing ‘counter-cultures.’ Is it also a question about what transmediale itself appears to be and is? And how it accomplishes the ‘message’ of confronting? But there is more to say about the video, if you continue watching the compelling documentations of The McLuhan Project on abc site. McLuhan talked about the concept of violence. Violence as encounters and self-expressing quest for identity, and media as a massive way of identity making: ‘Today when you trigger these vast media that we use you are manipulating entire population’ (see Marshal McLuhan ‘The Medium is the Message’ Part I, Monday Conference on ABC TV, 27 June 1977 08:30). Image: Marshall McLuhan Speaks, image by cea+. Sourced from Flickr, Creative Commons licensed.